The Kapikog Lake Cottage Owners Association is a non-profit organization registered as a corporation in the Province of Ontario. Its sole objective is to foster maintenance of the recreational and residential qualities of the lake and its surroundings for greatest enjoyment by residents. This is, of course, dependent on the interest and cooperation of each owner or visitor. Kapikog is one of a multitude of glacier-strewn lakes along the giant arc of Ontario’s Laurentian Shield from Georgian Bay to the Ottawa River. The area is now mostly a vast secondary forest of pine, hemlock, cedar, maple, birch, oak and beech with countless lake-river chains, warm summers, glorious colour displays in the autumn and snowy winters. Settlement and logging of the then prime forest began in the late 1800’s soon followed by recreational interest. In January 1900, a Paris, Kentucky newspaper reported a fishing expedition by some of its locals to the Kah-Pee-Kog Club in Muskoka. 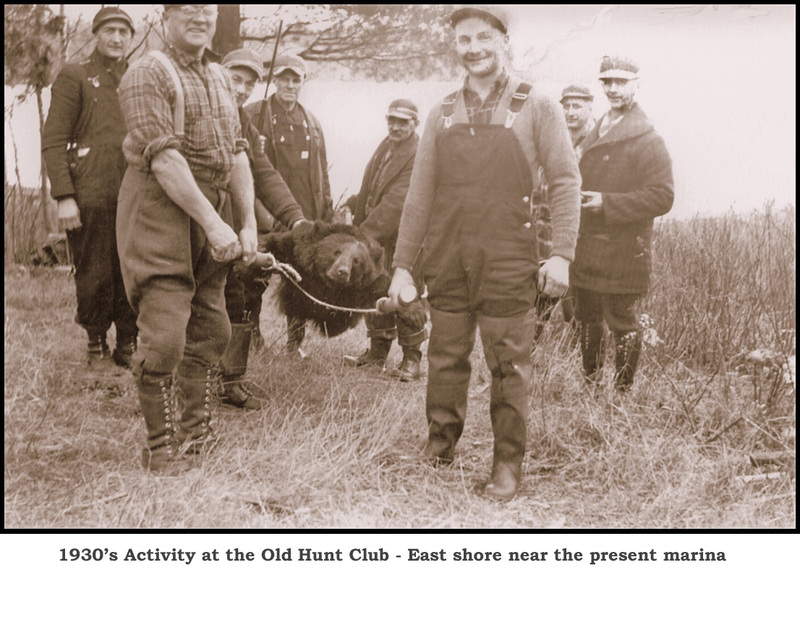 Pictured below are some happy bear-hunters in 1930. Following years of occupation by a few cottaging pioneers, the lake was surveyed in 1966 and some 102 lots of Crown Land sold at auction to prospective cottagers. In October 1979 a group of these cottagers chartered a train, which became famous as the Archipelago Express a.k.a. The Voting Train, to journey from Toronto to Parry Sound and vote for the formation of the Township of the Archipelago, a picturesque mainland and island area of granite, trees and water on the east side of Georgian Bay. Published each Spring, Summer and Winter. Click link to display issue.